A fifty nine years old lady came with pain in left side loin region with left side lower abdomen with nausea since 2 weeks. The pain was constantly in lower back and radiated to groins. She had burning urination and dark red colour urine with offensive smell. Patient initially had allopathic treatment to reduce the pain. She also had heaviness of abdomen with hear burn. Complaints < after taking small quantity of food. Eructation and flatulence since 7 months. Known asthmatic patient since 5 to 6 years treated with homoeopathic medicine. Hysterectomy done in 2011 for endometrial thickening with Dysfunctional Uterine bleeding. Father known bronchial asthmatic patient. • Urine – Burning Dark red colour, offensive < morning. Menarche at the age of 13th years , Menses regular, once in every 28 to 30 days , normal menstrual flow 4 days last. Menopause at the age of 48th years. • She get anger easily when her words contradicted. Desire company. • Aversion to physical work. 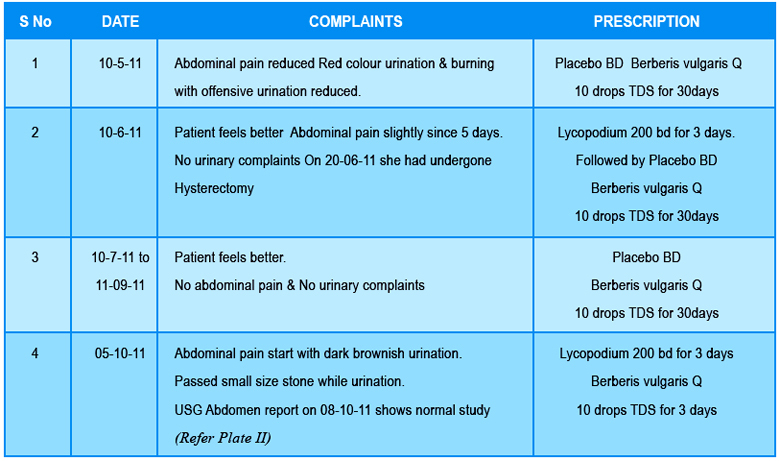 The case was prescribed with lycopodium based on the totality of symptoms and Berberis vulgaris Q was administered considering the acute stage and its specificity. 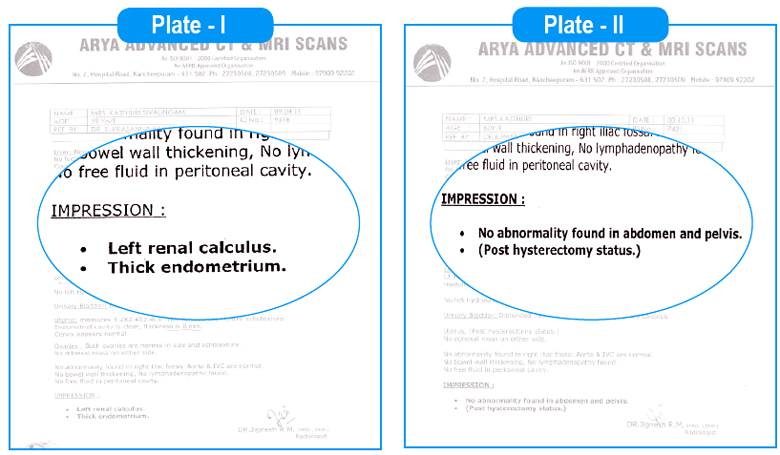 She got improvement, her scanning reported normal.